Together with Ezequiel Di Paolo, we have just published a new paper in which we explore how integrated information scales in very large systems. The capacity to integrate information is crucial for biological, neural and cognitive processes and it is regarded by Integrated Information Theory (IIT) proponents as a measure of conscious activity. In this paper we compute (analytically and numerically) the value of IIT measures (φ) for a family of Ising models of infinite size. This is exciting since it allows to explore situations that were very far to the kind of systems that can be generally analyzed in IIT, generally limited to a few units due to its computational cost. Moreover, our analysis allows us to connect features of integrated information with well-known features of critical phase transitions in statistical mechanics. I just published with Manuel Bedia a paper in Scientific Reports that results from an exploration of how tools from statistical mechanics could be used to model adaptive mechanisms. In this paper, we explore how adaptation to criticality could be used as a general adaptive mechanism in robots controlled by a neural network, using a simple mechanism that preserves a specific structure of correlations. This has interesting implications for thinking about neural and cognitive systems, which instead of relying on internal representations about an external world could adapt by preserving a complex structure of internal correlations. Abstract: Many biological and cognitive systems do not operate deep within one or other regime of activity. Instead, they are poised at critical points located at phase transitions in their parameter space. The pervasiveness of criticality suggests that there may be general principles inducing this behaviour, yet there is no well-founded theory for understanding how criticality is generated at a wide span of levels and contexts. In order to explore how criticality might emerge from general adaptive mechanisms, we propose a simple learning rule that maintains an internal organizational structure from a specific family of systems at criticality. We implement the mechanism in artificial embodied agents controlled by a neural network maintaining a correlation structure randomly sampled from an Ising model at critical temperature. Agents are evaluated in two classical reinforcement learning scenarios: the Mountain Car and the Acrobot double pendulum. In both cases the neural controller appears to reach a point of criticality, which coincides with a transition point between two regimes of the agent’s behaviour. These results suggest that adaptation to criticality could be used as a general adaptive mechanism in some circumstances, providing an alternative explanation for the pervasive presence of criticality in biological and cognitive systems. Crowd behaviour challenges our fundamental understanding of social phenomena. Involving complex interactions between multiple temporal and spatial scales of activity, its governing mechanisms defy conventional analysis. Using 1.5 million Twitter messages from the 15M movement in Spain as an example of multitudinous self-organization, we describe the coordination dynamics of the system measuring phase-locking statistics at different frequencies using wavelet transforms, identifying 8 frequency bands of entrained oscillations between 15 geographical nodes. Then we apply maximum entropy inference methods to describe Ising models capturing transient synchrony in our data at each frequency band. The models show that all frequency bands of the system operate near critical points of their parameter space and while fast frequencies present only a few metastable states displaying all-or-none synchronization, slow frequencies present a diversity of metastable states of partial synchronization. Furthermore, describing the state at each frequency band using the energy of the corresponding Ising model, we compute transfer entropy to characterize cross-scale interactions between frequency bands, showing a cascade of upward information flows in which each frequency band influences its contiguous slower bands and downward information flows where slow frequencies modulate distant fast frequencies. I recently started at a new postdoc position in the IAS Research Centre for Life, Mind and Society at the University of the Basque Country, funded by a postdoc grant from this university. I will be working with Ezequiel Di Paolo in my postdoc project ‘Information Theory and Maximum Entropy Modelling in Embodied Organisms’. This paper is an extension of some of the results worked during my PhD thesis. We investigate how the source of metastability in cognitive activity is not necessarily restricted to the action of neural circuits alone, but in some circumstances it can be generated from the sensorimotor coupling between an agent’s brain and its environment. 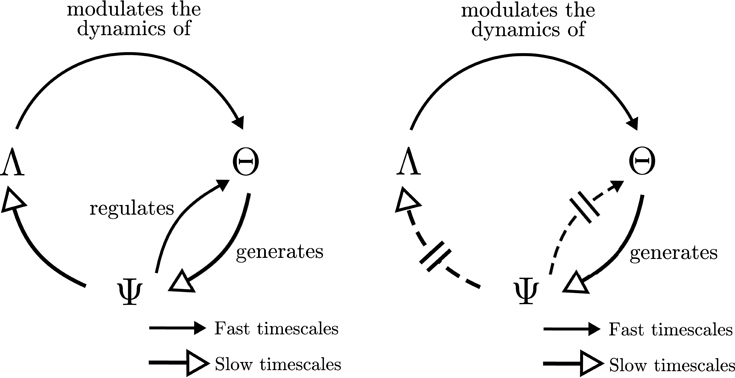 Using a robotic simulated agent and information theoretical tools we are able to show how (1) the bidirectional coupling between agent and environment brings the system closer to a regime of criticality and triggers the emergence of additional metastable states which are not found in the brain in isolation but extended to the whole system of sensorimotor interaction, (2) the synaptic plasticity of the agent is fundamental to sustain open structures in the neural controller of the agent flexibly engaging and disengaging different behavioral patterns that sustain sensorimotor metastable states, and (3) these extended metastable states emerge when the agent generates an asymmetrical circular loop of causal interaction with its environment, in which the agent responds to variability of the environment at fast timescales while acting over the environment at slow timescales, suggesting the constitution of the agent as an autonomous entity actively modulating its sensorimotor coupling with the world. Last week I defended my PhD dissertation entitled ‘Interaction Dynamics and Autonomy in Cognitive Systems’. It was a beautiful and intense experience for closing four years of work. The thesis was examined by Ricard Solé, Ezequiel di Paolo and Seth Bullock, which provided several points of discussion for a rich and stimulating debate about the contributions of the dissertation and lines of further development. I should thank Manuel Bedia, Xabier Barandiaran and Francisco Serón for their extraordinary work as supervisors and collaborators, as well as many other people that has supported the work developed in this dissertation. Some time ago I published a paper with Arnau Monterde, Antonio Calleja-López, Xabier Barandiaran y John Postill about collective identities in the 15M and related networked movements. We argue that the 15M movement in Spain demands conceptual and methodological innovations. Its rapid emergence, endurance, diversity, multifaceted development and adaptive capacity, posit numerous theoretical and methodological challenges. We show how the use of structural and dynamic analysis of interaction networks (in combination with qualitative data) is a valuable tool to track the shape and change of what we term the ‘systemic dimension’ of collective identities in network-movements. We show how the 15M movement displays a specific form of systemic collective identity we call ‘multitudinous identity’ , characterized by social transversality and internal heterogeneity, as well as a transient and distributed leadership driven by action initiatives. Our approach attends to the role of distributed interaction and transient leadership at a mesoscale level of organizational dynamics, which may contribute to contemporary discussions of collective identity in network-movements. It’s been some time since I started to develop a model of relational in a robot’s oscillatory neural controller. For a couple of years I have been intermittently working in a simulated agent in a behavioural preference task controlled by a homeostatic oscillator network, in which the relational variable that is kept constant is the phase relation between one oscillator and its surroundings. During the last year I have been working in different results around this model, and some of the first results are already published in this paper in PLOS ONE. In this paper (written together with Xabier Barandiaran, Manuel Bedia and Paco Serón), we analyse long-range correlations in the form of 1/f noise and self-organized criticality in the agent’s behaviour, and its relation with synaptic plasticity and sensorimotor coupling. We show that the emergence of self-organized criticality and 1/ƒ noise in our model is the result of three simultaneous conditions: a) non-linear interaction dynamics capable of generating stable collective patterns, b) internal plastic mechanisms modulating the sensorimotor flows, and c) strong sensorimotor coupling with the environment that induces transient metastable neurodynamic regimes. When one of these conditions is not met, a robust critical regime is unable to emerge. Together with Manuel Bedia, Tomás Gómez, David Larrode and Francisco Serón we just published a new paper presenting our results in applying 1/f and long-range correlation measures in social interaction dynamics. The paper is based on the Perceptual Crossing experiment, a minimal experimental setting reducing social interaction to one dimension. We find that human-human interaction presents a signature of long-range correlations not present when humans interact with artificial agents. This difference in signatures is not found between the individual behaviour of humans and artificial agents, suggesting that the qualitative difference of genuine social engagement lies in a shared space of interaction rather than in individual behaviour. I just came back from attending to the ANN SONIC Conference at Los Angeles. I was invited together with Javier Toret by Manuel Castells to present some of the results we have been developing during the last year at the DatAnalysis15M research network. We presented an analysis of how new large-scale models of social/political organization that have emerged during the last years around the Spanish 15M movement. We described two different types of large-scale organization: a first phase where crowds learn to strategically use social media and other digital tools to modulate collective action, massive emotional contagion and focus of swarm attention; and a second phase where some parts of the network start developing a strong functional specialization (e.g. the PAH network focused on foreclosure evictions, Marea Verde focused in public education, etc. ), creating a ecosystem which gives place to the emerge of a long-term robust network organization based on transient moments synchronization, in a similar way of how the dynamic core hypothesis suggest neural self-organization works. You can see here the slides of our presentation here.